Pics of the new Man Cave. 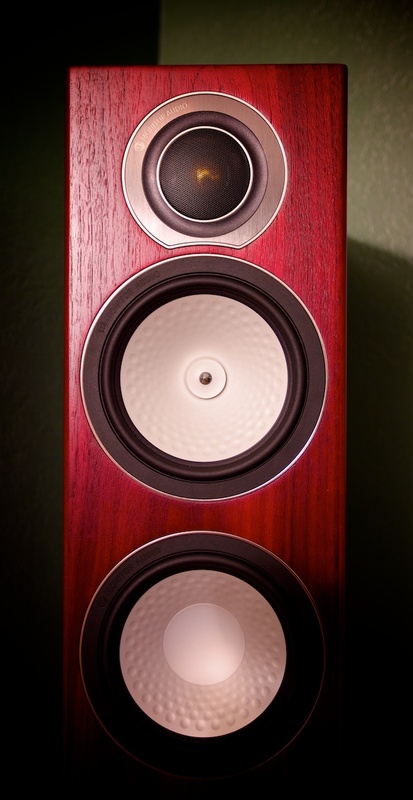 It was an early Christmas for me when I got my speakers installed yesterday, but there’s something terribly wrong. No, it’s not the fact that the subwoofer didn’t come in with the rest of the speakers, but clearly the TV is way too small! Looks like I need to start planning my first upgrade, hehe. 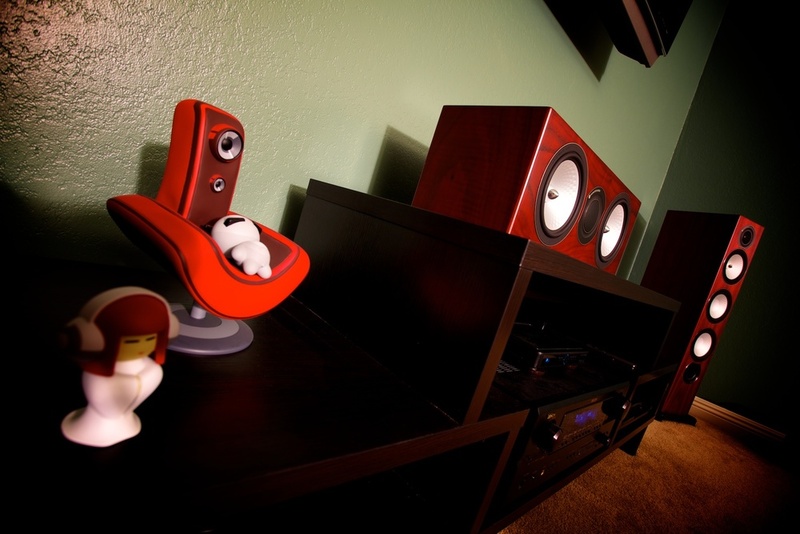 I was amused by how nicely my Tokyoplastic Koguma vinyls matched the Monitor Audio Silver RX Rosenut Wood Veneer color. I just had to put them on display nearby. Below are a couple views from the Entertainment and Office Sides of the setup. 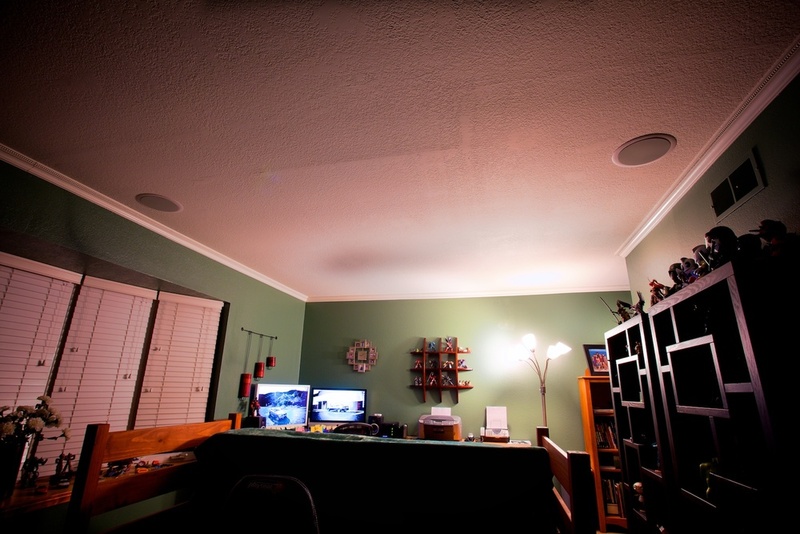 The last pic is pretty crappy but I just wanted to quickly show the speakers in the ceiling. The futon will eventually be replaced with a couple of bean bags since it kind of chops the room in half. The office portion of the space isn’t as tight as the picture makes it out to be. Should have picked a better shooting angle. The front of the futon is about the halfway mark in the room. The other big problem with this new setup is, I’m having a hard time getting myself out of this room. Even without the sub, the sound is pretty awesome. Even working on my computer is more pleasureable since the music is no longer coming out of the DX4 studio monitors (by M-Audio) on my desk. They’ve done a decent job these past 6 years, but nowhere near the quality of these Monitor Audio RX8’s. Big thanks to Ben and Ryan for helping me decide on this setup! 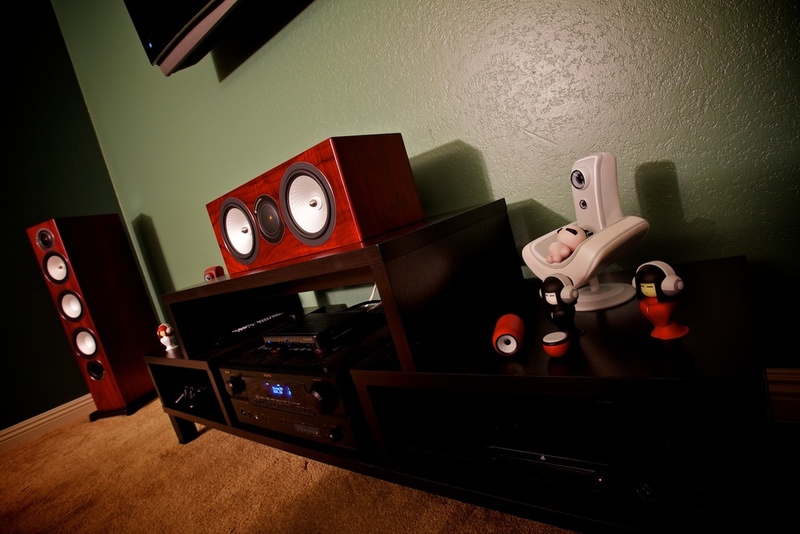 The music quality is much better than my previous home theater setup which was optimized for movies. This setup is far more versatile, and playing Gran Turismo 5 is fantastic with the sounds wizzing by on the proper sides. I was going to wait for the subwoofer before I watch an action movie, but I’m not sure I’ll be able to hold out. 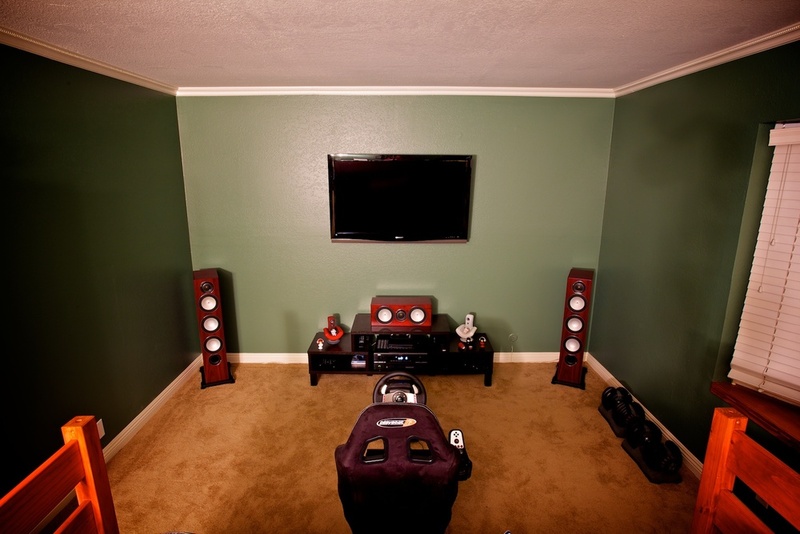 TV and Speaker installation by Jaime Garau of Orange Coast Audio Video.